I remember when the Archiver's opened up in Louisville in the fall of 2006. I was thrilled to finally step inside the store I'd seen advertised so heavily in all the scrapbook magazines. Every aisle contained something I'd only seen in ads in the same magazines. 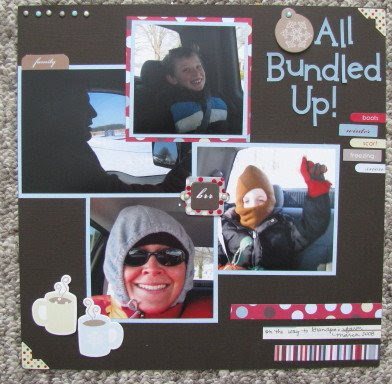 I was in a scrapbooker's heaven! One of my first purchases at the store was a winter themed line by KI Memories. I bought it all...the papers, ribbons set, the chipboard accents, epoxy stickers, alpha stickers and accent stickers...even little "test tubes" full of embellishments like brads, stars, paper clips and mini letters. I used some of it, but wanted to "save" it since it was so nice. I remember at the time, I even skimped on using the embellishments since they were sort of pricey...I wanted to stretch them out a bit. Well, you know what happens when you save scrap supplies, right? They sit. They get moved around. They get replaced by your latest purchase and you forget about them. Last month, I was reacquainted with this KI line of supplies. I was completing a challenge to "crop a photo creatively." I had a 5x7 of Bake waving in the snow and I decided cropping it into three pieces and matting them on the same mat was about as "creative" as I would allow myself to get. When I went through my bin of papers, I came across the KI line and I decided to get some use of the whole thing. 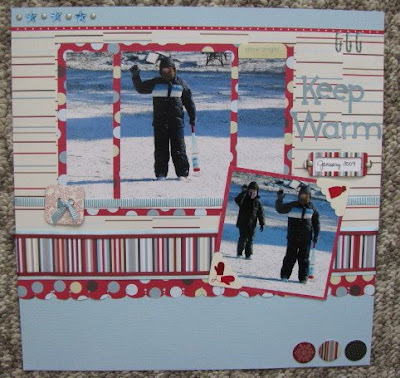 To my surprise, "Keep Warm" is a layout that I really like. In fact, I think I love it. I used the embellishments freely because I felt bad for them sitting in a baggie for almost three years! At the end of my scrap session, I had three layouts that made me smile and an empty "kit" bag. I think I need to dig back through my bins more often in addition to grabbing my new favorites to work with. I also realize that I don't need to "save" my supplies. I need to enjoy them! I think we all do that! Funny that we hang on to it so long before using it! 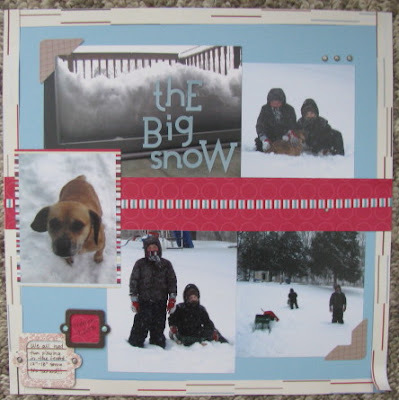 Great layouts and way to use up old supplies! Amy, glad to hear I am not the only one "saving" my supplies, luckily as I have gotten older I have gotten better at letting go and using things! Love your layouts using your KI stuff!